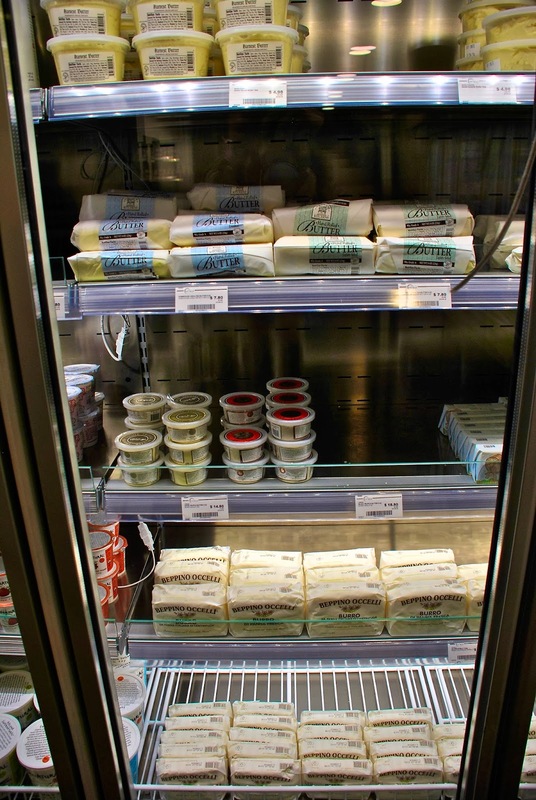 Places I've Eaten: EATALY CHICAGO IS A FOODPLOSION....BUT WAS IT WORTH IT? EATALY CHICAGO IS A FOODPLOSION....BUT WAS IT WORTH IT? I was in Chicago over the holidays and while there I was determined to check out Eataly--sort of a department store of food and eats aimed directly at the foodie market and a bit at the Food Network Market. I read innumerable things about the place before, during and after it opened and was intrigued at least to check it out and see what all the hype was about. It was a bitterly cold day when we got there right before they opened. They have a coffee cafe downstairs that we waited at until the place officially opened. Walking in the place is very clean, very white (lots of white tile) and very, very huge. It is two full floors of food and it's related accessories. I took a number of pictures of the place and below are a few--if you want to see the full range you can check them all at my tumblr here or flickr here. The bottom floor is filled with a cafe, a crepery, a bakery and a gelato place--on one side. On the other side is fresh fruits and vegetables, kitchen accessories, chocolates, butters, canned things and more. And they don't just have one or two kinds of this stuff they have multiples with varying degrees of price. Like the chocolate from a few bucks to a huge chunk at $70. And like 6 or 7 kinds of butter--I mean who knew there were that many and why would you really need that many? The second floor is even bigger than the first. From bread to pasta, fish, meat, cheese, sauces--the list is endless. 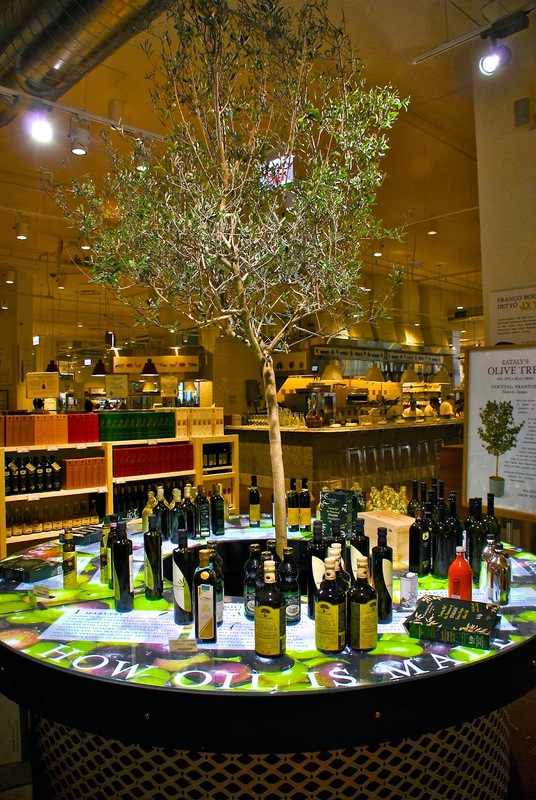 They even an olive tree in the store and any kind of olive oil you can think of--right up to one bottle that was around $300. The whole place is like an epicurean foodie paradise and I did kind of enjoy just wandering around to look at all the different types of everything they had to offer. It does really open your mind to all the choices and possibilities. I put it akin to going through a bookstore of food--and yes they also have cookbooks galore to peruse. You can watch the actual process of them making bread, mozzarella, preparing meats and fish--it's like a great behind the scenes tour of chefs at work. Quite fascinating. But this is also a place to get a bite to eat. They have a couple go in and site down restaurants specializing in a specific thing like meat, pizza or fish. And then they have these different counters you can sit at and eat situated like a piazza--you can choose from cheese, seafood, fried things, etc. Thing is though you can pretty much sit at any of the counters and order stuff from any other counter. This is the part that was a bit confusing, it doesn't really tell you that and we sort of figured it out on our own. So even though the cheese counter was full of folks we could have easily sat at the seafood bar and still ordered cheese through our server. Since we were there about an hour before the eating parts opened we wandered around, looked at stuff and tried to decided which of the places to dine at. After looking at choice we wandered over to the pizza place and the hostess handed us a menu after I interrupted her conversation with her co-worker to get one. I told the SO since this place was Italian we really should try the pizza. Unfortunately the hostess said they didn't officially open for another 15 minutes so we handed the menu back to her, told her we'd be back and headed to the coffee shop downstairs to kill time and she went right back talking to her co-worker. At 11am we headed back upstairs to the pizza area and we couldn't believe it. There was a huge line snaking the entire length of the place to get in the pizza area where before there had been no line. At this point I was kind of pissed, I mean the hostess probably knew this was going to happen and it would have been nice had she said something like we get crowded you may want to wait here. But no, it was more important to continue her other conversation. We had a flight to eventually catch and that line was going to fill the whole place and still be a wait. I was determined to eat somewhere in there so we just decided to grab a quick snack at one of the counters. We picked il frito as it was pretty much the only one not crowded and we like fried stuff anyway. As I said before we could order from any of the counters but the fried stuff looked tasty and we picked two dishes to share. The verdure miste--seasonal vegetables in a tempura batter deep fried in olive oil and the pappa al pomodoro--a Tuscan bread and tomato soup thing. The veggies were a mix of beets, cauliflower, broccolini, yellow carrots and potatoes. We watched them cook it in front of us. The broccolini was the best fried this way and the carrots were also pretty tasty. I like beets though I'm not totally sold on deep frying them. The potato pieces in here though should have been cooked a little longer as they were pretty much raw. As a light bite it was pretty good though I couldn't help thinking having some kind of specialized dip for them would have been nice. The other dish was basically a ball of tomato soup enshrouded in Tuscan bread crumbs and then deep fried. I'll say I wasn't the biggest fan of these. The SO mostly liked them. We thought since it was soup inside that it would pour out when you opened it but most of them it just plopped out like a thick tomato paste and one of them was practically empty. They were also a bit over cooked. Interesting idea, but for me, not a winner. They did actually serve us some fresh bread and heartily green olive oil to snack on which was good. Overall the things we had were okay but they didn't really make my tastebuds excited. It's possible I was still bummed about the pizza fiasco, oh well. One word of warning though about parking in the area. We found a place next to Eataly and a sign on the way out said they validated parking up to 3 hours--that's all it said nothing else. After we ate we went to the customer service desk and got our ticket validated and asked about other sites in the area. For that they were very nice helpful and cheery. However, what they don't inform you about is that they only validate for 3 hours--which means you HAVE TO LEAVE THE GARAGE IN THAT 3 HOUR SPAN. We thought they would cover 3 hours and then we would just pay whatever the extra was after we tooled around the block to see some other stores. Well, turns out that if you don't leave at that 3 hour mark the validation becomes null and void and you have to pay what it would cost for a FULL DAY!! Which ended up being $42. Nowhere was this explained in any detail. The guy at the parking garage, who really could have cared less, when I said that info wasn't posted anywhere, he actually said to us--"it's on our website." I think that was when I lost it and said a few words I shall not repeat. We tried calling the parking garage management and the Eataly's customer service but from their stand point--them's the rules--no exceptions. Between the parking and pizza it but more than a sour taste in my mouth. On the one hand, it's kind of a cool place and I could actually see something like that working here in San Francisco. On the other hand between the so-so food and the unhelpful hostess and parking attendant it's a trade off of whether I'd buy or eat anything here just on principle. Otherwise, I guess if you are in Chicago and are really into food, then as a tourist stop it's kind of worth it. Just remember to take public transportation and line up for the pizza place early--you've been warned. OMG, this looks so fun! aside from the actual food we ate it kind of was. Your Chicago restaurants food eating points looks fabulous. I wish I also get chance to visit this beautiful place,. Thanks for posting your restaurants images here!! Follow Places I've Eaten on Social Media!